UPPER EAST SIDE — Sutton Clocks has kept time on the northwest corner of Lexington Avenue and 61st Street since 1967, but this neighborhood fixture may be a thing of the past before the end of the year. 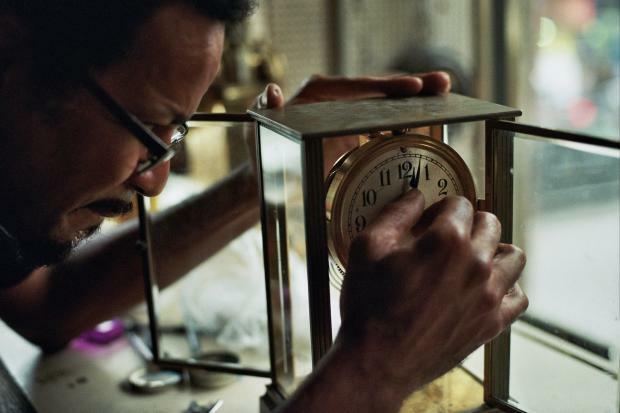 Owner Sebastian Laws, one of the few horologists left in New York City, works out of a tiny space without air conditioning and often without electric light. “It’s a very old feel,” he said of the nearly 400-square-foot space filled with clocks of different centuries and pedigrees, from 200-year-old carriage clocks and grandfather clocks to metal art deco alarm clocks. Last week, the store was filled with clocks that ticked, tocked, chimed, gonged, beeped and chirped — often at the wrong time, which is why they were here. “You can imagine a horologist a century ago working in similar conditions," said Laws. "There’s a lot of contemplation. Many of these older clocks have pieces that were made by hand, and then had repairs made by another clockmaker,” he said. “So, it’s interesting to get into another mindset as you’re fixing it and pay homage to how they wanted it to work." Like an old-fashioned doctor, Laws makes house calls, toolkit in hand, to all parts of the five boroughs, repairing clocks on-site or bringing clock mechanisms back to his shop where he often constructs his own parts. “Some of these clocks are over 200 years old and the parts just aren’t available,” he explained. “The clocks are like guests,” he said. “Sometimes they go and come back. I don’t really get attached. It’s like a short stay. They’re passing through. Most of his clocks stay for three to four weeks, depending on the complexity of the work. Some stay for months while parts are designed and built. “A clock has to run well for a week before it’s ready,” said Laws. Laws, 45, who doesn’t wear a watch and owns only three clocks in the Upper West Side apartment he shares with his wife and daughter, began tinkering with timepieces as a child. His customers come from all over the world, including a couple from around the corner. Susan Baum and her husband, Ted, climbed the two flights of stairs with a carefully wrapped timepiece modeled on a melting clock from Salvador Dalì’s painting, "The Persistence of Memory." It no longer keeps time. Laws is searching for a small but visible space filled with natural light, in the same neighborhood or in a location easily reachable by his customers. “I’m going to miss being in a certain spot,” he said. “The memories of working with my dad and learning the trade will never leave me. But I don’t look at it as a sad thing as much as it’s the next stage. MAP: How Diverse (or Not) Is Your Kid's Public School?